Freshman Sam Boyle joins junior Charlie. 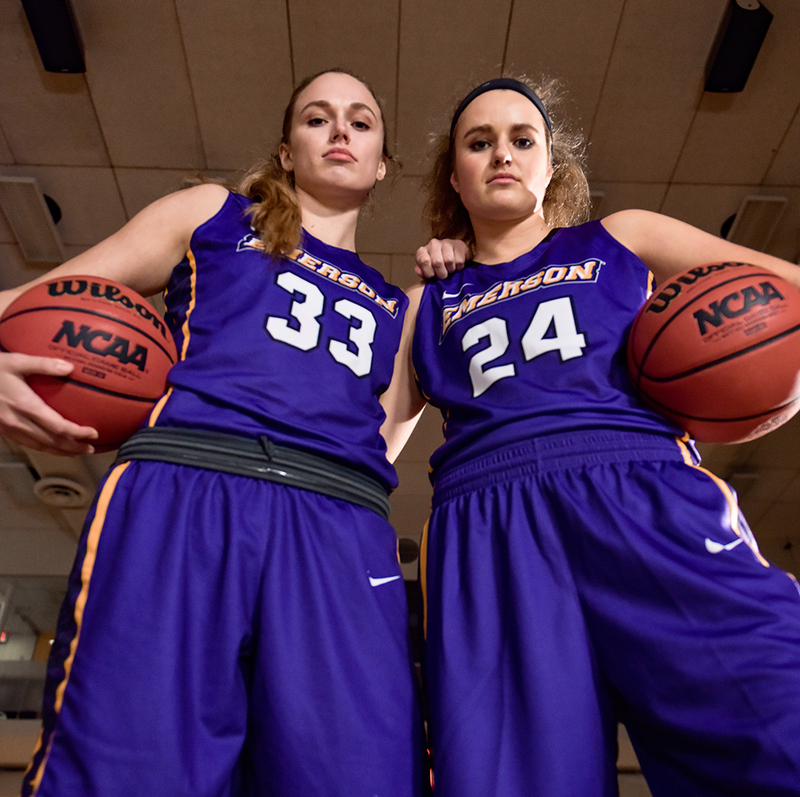 In the Emerson women’s basketball season opener against Gordon, junior forward Charlie Boyle was out of the starting lineup and only saw five minutes of action, but a Boyle still took the opening tip for the Lions. Freshman forward Sam Boyle, Charlie’s younger sister, finished her collegiate debut with a team-high 14 points. The pair played together for two years at Scotts Valley High School in Scotts Valley, California. Sam said her sister influenced her decision to attend Emerson, with Charlie half-jokingly reminding her where she’d end up. The Boyle sisters come from a family that revolves around not just basketball, but sports in general. Both played softball at different times during their high school careers, and Sam earned first team all-league honors as an outside hitter in volleyball. Their parents, Chuck Boyle and Lorraine Stewart, helped coach Charlie and Sam before they entered high school, and are still active in sports. Chuck played collegiate basketball at Foothill College and Virginia Commonwealth University. “Sports for us were more about teaching life lessons, keeping them busy, keeping them active, and they excelled at various different sports,” Stewart said. Back home, when they were both in high school, Sam Boyle said the family would play pickup basketball games as a family event. Charlie has yet to see her usual minutes on the floor because of a back injury sustained before the season. The elder Boyle came off the bench in the first three games of the year and sat out the following three contests entirely. She said she’ll likely be out until after winter break. Sam has filled her sister’s absence for the Lions, starting every game and leading the team in rebounds. Standing at 5-foot-11-inches, she’s played in Charlie’s typical role as a post player instead of her natural position as a forward who slashes in from the perimeter. “This year is one of the first years where I’m actually being put in the post in awhile, so I have to learn a whole new skill set,” Sam Boyle said. Chuck Boyle said the sisters’ different styles compliment each other and should produce an interesting dynamic when Charlie fully recovers. Coming off a sophomore campaign that yielded Second Team All-NEWMAC honors, Charlie Boyle said Sam might reduce the pressure opposing defenses send her way. Head coach Bill Gould said he hopes to take advantage of the sisters’ history playing together. As a post player, Charlie Boyle usually finds herself stationary in the paint during a game. Charlie said her chemistry with her sister will primarily be displayed through Sam’s ability to read her well. Gould said he won’t give preference to the younger Boyle regardless of her older sister’s established success. “Sam’s a good player in her own right, and whether or not Charlie is here, Sam will earn everything that she gets,” Gould said. With Charlie inching closer to full health, both sisters said they’re excited to be on the court with each other again. “I just hope that we play at the same time,” Charlie Boyle said.